Inflation in the Eurozone dropped to 0.8% in December, slipping from 0.9% in the previous month. With the European Central Bank's target being 2%, they expressed a potential willingness to strengthen their forward guidance. Nevertheless, the trading range for the euro was rather thin, with the common currency rising just 15 points against the US dollar to close at $1.3619. A German report disappointed currency investors by indicating a slowdown in the country's economic growth and this pushed the euro/dollar pair 72 points lower to $1.3605. At the same time, across the pond, the world's biggest economy posted another set of good results, helping to boost the dollar by fuelling fresh speculation that the Fed will stay on course for tapering. The euro-dollar pair recovered just 11 points to $1.3678 as risk on sentiment in the currency market is not really in favour right now. If anything, market participants were on standby for the release of the Beige Book survey to better understand the state of the US economy. After all, many believe that the world's biggest economy will outperform its European counterpart this year, dragging its currency higher as well. 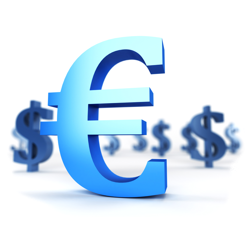 The euro remained fairly flat against the dollar yesterday, swinging marginally around the $1.3671 mark. Spread betting investors may well be waiting for inflation numbers to be released from both sides of the Atlantic later in the week before committing further. At the same time, retail sales data should give another indication of the overall economic strength. The dollar fell back on Friday as the below-forecast rise in US jobs eased some concerns that the Fed might go up a gear in its tapering plans. In turn, the euro advanced 58 points to $1.3664, suggesting that a bumpy ride lies ahead and that the predictions of a strong comeback for the dollar during 2014 are not that crystal clear anymore.